A new partnership between the College of William & Mary’s Virginia Institute of Marine Science, the National Oceanic and Atmospheric Administration, the U.S. Army Corps of Engineers, the Federal Emergency Management Agency, and representatives from state agencies, nongovernmental organizations, academia, and private industry has formed to explore new ways to protect U.S. coastlines. At issue is finding efficient, cost-effective ways for coastal communities to manage the threat of rising sea level and increasing coastal storms. Advancing a hybrid engineering approach that integrates green and gray strategies — an effort referred to as Systems Approach to Geomorphic Engineering (SAGE) — the partnership’s goal is to create a “community of practice” to make coasts more resilient. A new website compiles and makes available information to community leaders, resource managers, developers, and the public. 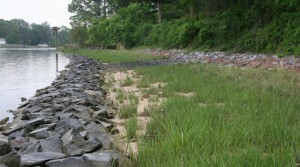 The website contains a database of more than 100 coastal resilience projects that embrace SAGE principles and incorporate green infrastructure designs to stabilize shorelines, restore habitats, and manage floodplains. Examples include a range of site, design, and partnership information that cover projects working to restore dunes, oyster reefs, and wetlands. Varying from large-scale living shoreline developments to the installation of 1.2-ha (3-ac) tidal wetlands, the projects demonstrate how communities can use SAGE approaches in their own planning and development.